The consequences of inaction on climate change are grave. We are already seeing the impacts of climate change on our communities and facing substantial costs from these impacts. We can significantly decrease these impacts with strong and sustained efforts to address the pollution driving climate change. 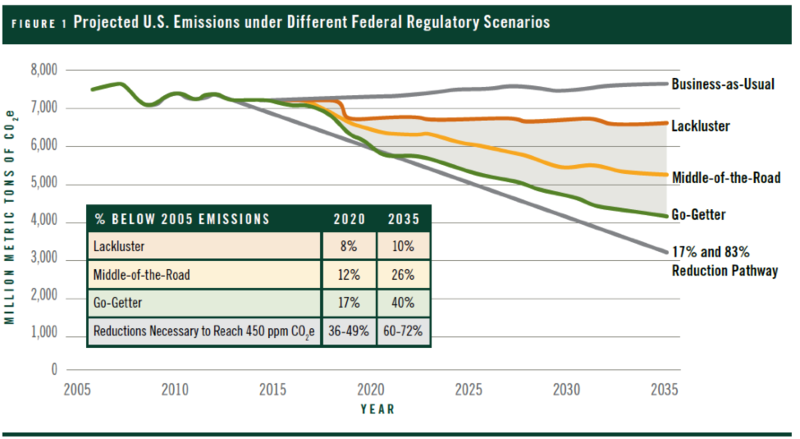 The new U.S. climate target to cut emissions 26 to 28 percent below 2005 levels in 2025 is essential to helping stave off the worst of these impacts. In response to this announced target we’ve heard naysayers say things like: it can’t be achieved without destroying the economy, other countries like China and India won’t act, and U.S. action won’t really have an impact on global climate change. These arguments are false and here is why. Under existing law, President Obama has set in motion a number of carbon-cutting actions including carbon pollution standards for America’s power plants, improved vehicle efficiency standards, appliance efficiency standards, efforts to address methane, and standards to reduce the climate pollution of coolants used in air conditioners and refrigerators. The U.S. can meet both its 2020 and 2025 targets using existing laws like the Clean Air Act, energy efficiency laws, and steps to protect our public lands and waters. Analysis from groups like the World Resources Institute (WRI) has found that cuts on this order are achievable under existing laws. WRI found under its “go-getter” scenario cuts of 28 percent were achievable based upon existing federal and state laws and policies. For these and other reasons this new U.S. climate protection target has broad support from leading businesses, entrepreneurs, Latino leaders, faith-based organizations, labor groups and many Members of Congress. For almost two-decades, inaction on climate change in the U.S. has been a major stumbling block to securing strong international action on climate change. When the U.S. is willing to step forward domestically, it can have a catalyzing impact in other countries. This is evident in the new commitment from China. As a part of the U.S.-China agreement, China’s President committed to peak its carbon pollution by 2030, with the intention to try to peak early, and committed to increase the non-fossil fuel share of all energy to around 20 percent by 2030. This is a commitment to even deeper cuts in the country’s climate pollution than many expected was achievable just a few short years ago. In fact, prior to the announcement many experts, including the U.S. Energy Information Administration, predicted that China’s emissions wouldn’t peak until well after 2040. This U.S. action couldn’t come at a more critical juncture as leaders meet later this year to finalize a new international agreement to address climate change. This agreement will solidify even deeper commitments from key countries around the world. Already the European Union, Switzerland, Norway, Mexico, and China have announced the outlines of their new commitments as a part of this agreement. To date, countries accounting for 58 percent of carbon pollution from the energy sector have announced post-2020 climate targets. And more countries around the world like India, South Korea, Brazil, South Africa, and Indonesia are diligently working on their proposed targets as a part of the international agreement. Why would some question our ability to rise to the challenge of climate change? We are confident that this target can be achieved. America has never shied away from great challenges. Time and again we have found that when we focus, unleash our ingenuity, and lead by example we can address the great challenges facing humanity. Climate change shouldn’t be any different. And when the world’s largest economy acts it sends a powerful signal to other governments that they also can and must act aggressively on climate change.